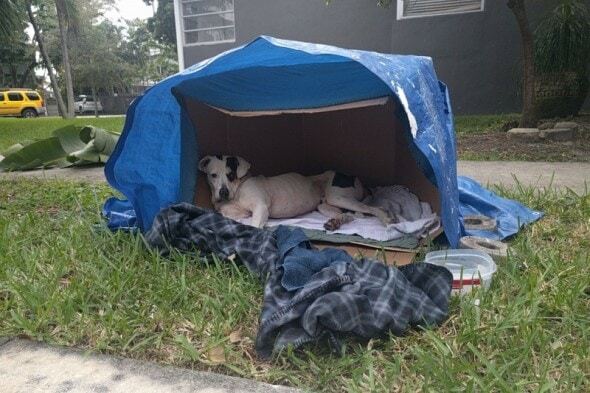 For residents near 10th Avenue and North River Drive in Miami, finding an abandoned dog on their streets is very common. Their neighborhood is just blocks away from Overtown, an area known for drugs, crime and dog fights. When an abandoned and abused animal is found, instead of turning them into animal control locals take it upon themselves to save them. They know the fate of the “unwanted” is better off with them than at the local pound. Just last weekend, Joey was abandoned on the streets with nothing more than a blanket and a plastic bowl with water. The loyal pet stayed on the very same spot he last saw his owner as if to say he is staying there waiting for whoever left him to return. 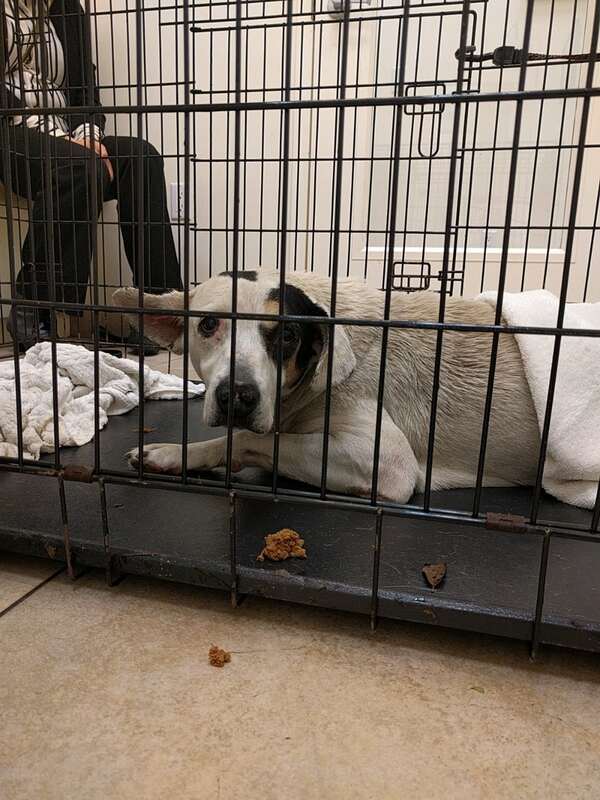 Community members knew no one was coming back to get him and that’s when they came together to save this pet. Rescuers told The Dodo that a neighbor dropped off a box Joey could use as shelter. As the weather turned rainy and cold another person draped a tarp over the box for additional protection. 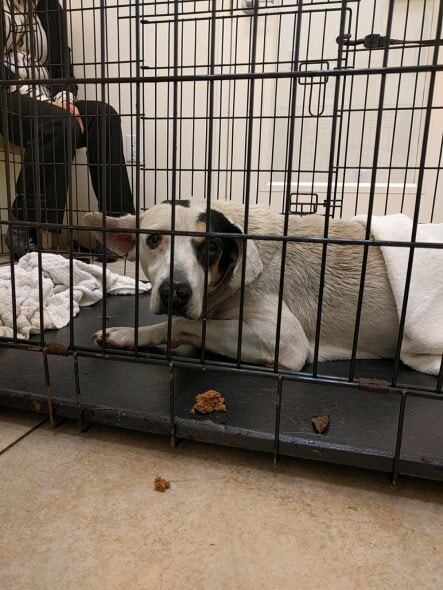 Others dropped off blankets and food and worked towards gaining his trust, but as expected he trusted no one and every time someone tried to approach him he would run away. What was needed was a trained professional to rescue him but no trained professional contacted by the caring residents had answered the calls or agreed to help. Just yesterday after four days on the streets Joey was rescued. 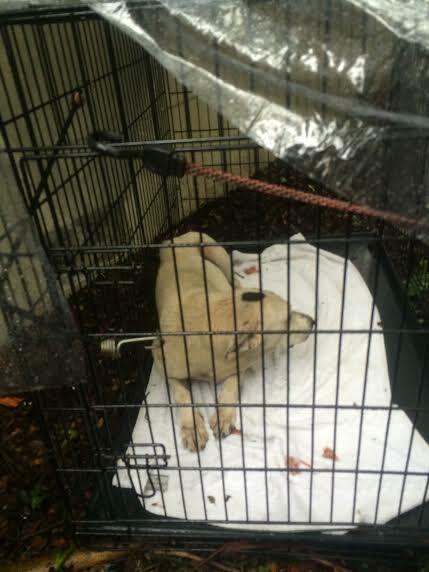 He was safely captured and with the use of a crate he was transported to a veterinarian. Best of all, Animal Recover Mission stepped up to sponsor the dog’s medical costs. The once abused and unwanted dog will no longer go hungry or cold. From now on all he will now is love and this is all thanks to the animal loving community who helped rescue him. To learn more about Joey and how you can help visit the GoFundMe page created the caring neighbors. Bless them <3 Poor baby, so loyal waiting for the POS that dumped him. I hope he finds a loving home soon! Sweet ending, hope he finds a forever home. Thank you all for being so kind ! I’m so happy to hear this news. I hope we’ll get to see a follow up story and picture of him when he’s recovered and happy. Bless you all for sticking with Joey. You poor Sweet baby! HOW can someone do this to a beautiful innocent animal. Just leave him like an old shoe. GOD watch over this baby always. We all love you Joey! Thank heavens for people who rescue that way. Miami Dade Animal Shelter is full of people who abuse the animals in their care. Vanessa Hurtado read the story ?? there are people like us around Miami ?? sinful, truely sinful what people do to these beautiful furbabies!! If he’s not getting to the vet it is heartfelt and misguided help. God bless those Angels!! The world is, Indeed, better with people such as these. Clicking on this brought me to a spam site. Be careful. I hope they didn’t damage my account. God bless you for taking care of your own ! May all the devils in hell follow this family for doing this. There is a go fund me set up and he was on his way to the vet yesterday, I believe it was. So happy that there are still decent caring people in the world. God Bless You All! Heartless people how can you abandoned your dog . Love to hear the happy stories of dogs getting off the streets & being treated properly! Thank you to all involved in starting Joeys new life!!! Thank you for helping this poor dog x shame on his hateful owners!! God bless you all who went and helped out this poor thing . This is happening all the time , bless you all for taking the time and compassion for Joey.